If you're planning a trip to Santorini, don't miss out on these Santorini sightseeing tours! I've selected 10 of the best Santorini tours so you can experience more of the most beautiful island in Greece. You've made the decision to visit Santorini. You know you want to see the sunset and take awesome photos, but what else is there to do? Santorini, the world-famous Greek island, has a lot to offer. 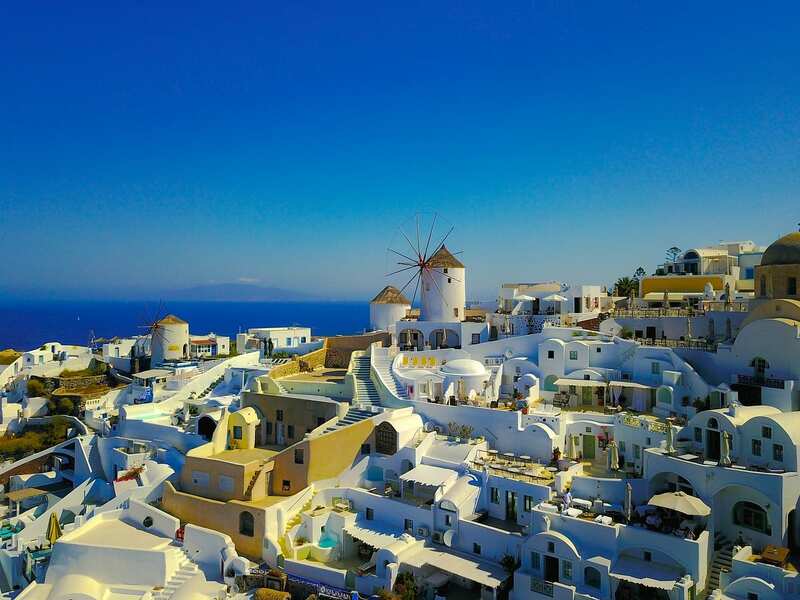 Visiting the ancient site of Akrotiri, the amazing wineries, the lovely beaches and the awesome volcano are just a few of the things to do in Santorini. While it’s possible to visit most of these places independently, it is also possible to book various tours. 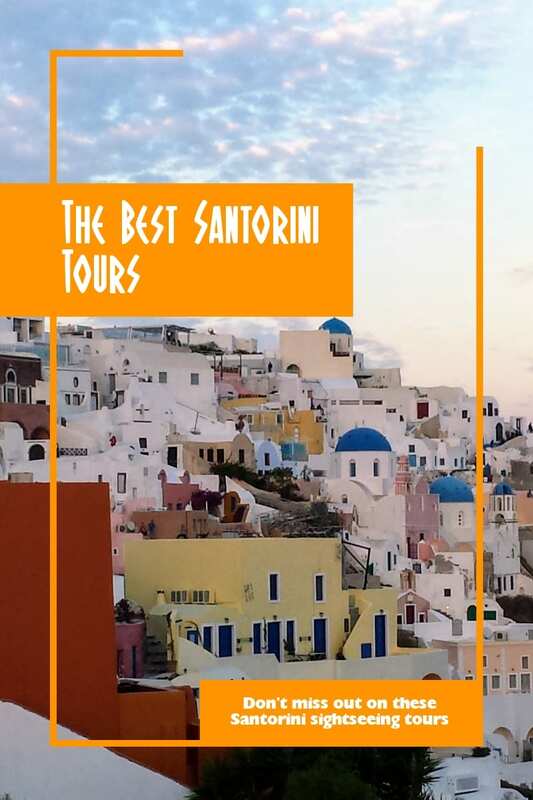 Here is a list of the best tours in Santorini for 2019. If you are going to Santorini, you absolutely must visit the volcanic islands that are a short boat ride away. This boat tour will pass by the uninhabited islands from Nea Kameni and Palea Kameni, where you will have the chance to walk on volcanic grounds and swim at thermal springs. You will also visit the smaller island of Thirassia, where people from Santorini often take mini-breaks. The tour ends in Oia, where you can stay longer to see the sunset if you want. If you want to take a Santorini boat tour but aren’t too interested in walking on the volcano, you can opt for a catamaran cruise, focusing on visiting beaches and swimming. In all fairness, the volcano can get uncomfortable hot in summer, so this cruise will suit better people who don’t cope well with high temperatures, or just want to relax and take it easy. You can take the Santorini Catamaran Tour either in the morning or in the afternoon, when you will also see the sunset. A lunch / dinner on board is included too. I think the Santorini Catamaran Sunset Cruise is the best option. The Santorini bus tour is ideal for people with limited time on Santorini, or those who want to see the most important sites on the island in one day. The shared bus will pick you up from a meeting point close to your hotel, and will drive you around the island. During this tour, you will explore the ancient site of Akrotiri with a licensed guide, relax on a couple of the famous Santorini beaches, Perissa and Red Beach, and visit two of Santorini’s most picturesque villages, Emporio and Profitis Ilias. You will also have the chance to taste the local wines at one of the famous Santorini wineries. The day will end with a stop in Oia village, where you will see the most photographed sunset in Greece. This bus tour of Santorini is great if you want to meet other like-minded travelers and make new friends while you are exploring Santorini, but are not keen on a full day tour. In this tour, you will visit some of the less visited villages, like the traditional settlement of Megalochori, and take in the views from the island’s highest point, Profitis Ilias. You will explore the ancient site of Akrotiri, and have plenty of time to go to both Red Beach and Perivolos beach, where there will be a stop for swimming and lunch. Finally, you will get to visit one winery and taste the famous Santorini wines. Private Santorini tours are ideal for groups or families of up to 4 people, who want an introduction to the island. You will visit several towns and villages in Santorini, and get the chance to learn a little about the island’s history. Apart from the popular towns of Oia and Firostefani, you will also visit Profitis Ilias, on Santorini’s highest mountain, as well as Pyrgos, the old capital with the ruins of a Venetian castle. You will also have time to explore the Akrotiri ancient site, and visit one of the most popular Santorini wineries, the Venetsanos winery. Finally, you will have time on the Red and Black beaches, with an optional stop for lunch. Although most Santorini tours will include a stop at one winery, you might be interested in a more specific winery tour. During this tour, you will learn a lot about the wine making process and the special types of local Santorini grapes. Needless to say, you will get to taste a few of the famous Santorini wines, and perhaps buy a bottle or two to take back home. This tour is ideal if you want to explore the island on your own, but still want a private licensed guide to understand more about the ancient site of Akrotiri, which dates from the Minoan Bronze Age. The settlement was already developed by the end of 3rd millennium BC, and it expanded further later, when a drainage system and paved streets were introduced. It was an important place for trade and arts, most notable pottery. The settlement was destroyed due to the eruption of the volcano in the 16th century BC. Fortunately, volcanic ash preserved some parts of the site, such as buildings, remains of frescoes and artworks. You can choose a tour with or without hotel pick-up. 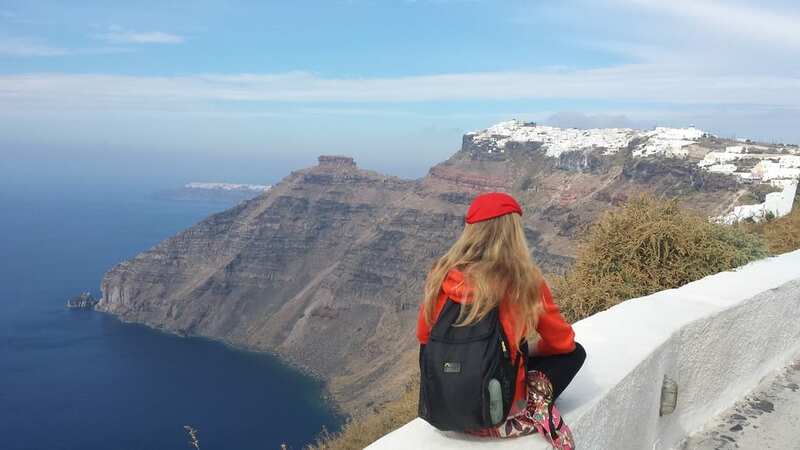 While it’s entirely possible to hike from Fira to Oia on your own, you can also hike with a local guide who will give you information about Santorini. The 10 km / 6 mile hike begins at Fira and ends in Oia, and is an easy, comfortable hike with only one or two steep parts. It should take you anything from 2,5 to 3,5 hours to complete the hike, depending on the number of stops and your walking speed. I can definitely recommend this hike, as it was one of my favourite things to do in Santorini. If you want to take the best photos of Santorini, you would be interested in a photography tour run by a passionate photographer, Konstantina Sidiropoulou. Santorini is a truly picturesque place, and it isn’t necessarily easy to discover everything on your own in just a few days. In both tours, you will be taken to the best places in Santorini to take good pictures, taking into account the light, time of day and weather conditions. The evening Santorini photography tour also includes a quick workshop on how to take good night shots. If you are looking for something different in Santorini, this is the tour for you! You will visit some of the less visited villages in Santorini, and explore the island from the saddle of an e-bike. Although I haven’t done this tour myself, I will make sure to get in touch with this company when I go back to Santorini. If you want a completely private, customized experience on Santorini, this option is ideal. You can ask all the questions you wanted about Santorini and Greece, and you can also visit places that are not too popular with visitors, like the Donkey Brewery. It’s also recommended if you don’t want to rent a car yourself, but still want to visit places that aren’t accessible on public transport. Would you like more information on planning a trip to Santorini and Greece? Sign up for my free travel guides below, and I'll send you a series of guides designed to help you create the perfect vacation in Santorini and Greece! Hi Dave, we will be staying in Mykonos but would like to go to Santorini for a couple days. My question is I get motion sickness, what do you suggest for getting there and back? A flight? A ferry? I just hear it’s very windy I’m afraid of rocking and rolling out on the water. Your thoughts please. The ferries are pretty big beasts, so you might not feel much movement at all. I’m not particularly great with sea-sickness myself, but never had a problem on these big ferries. I know some people use Dramamine, but never felt the need on a Greek ferry so far.